Whistler Blackcomb, one of the most iconic ski areas in the world, is being acquired by Vail Resorts in a deal worth $1.05 billion. The deal was announced Aug. 8 in a Vail Resorts press release. Whistler Blackcomb becomes only the latest addition to Vail’s massive portfolio. 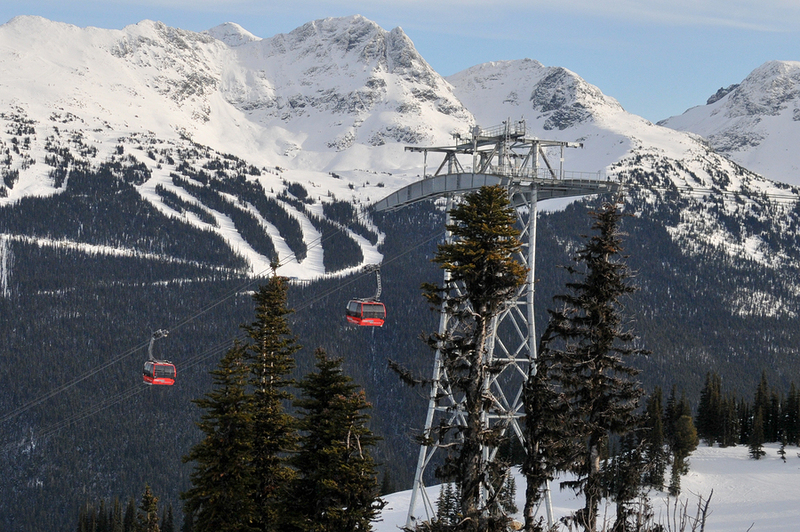 Whistler Blackcomb is about 75 miles from Vancouver, B.C. It draws over 2 million people every year. Although business has increased steadily at the British Columbia resort, management of the 8,100-acre ski area have expressed concern about the effect of climate change, which has caused delayed season openings or early season closings due to lack of snow. Dave Brownlie, chief executive officer at Whistler Blackcomb, said that the B.C. resort could expand its ski terrain by about 25 percent. Vail said it plans to “invest substantially” in the infrastructure of its latest addition, and continue to expand the resort’s four-season activities. Vail plans to keep local leadership at Whistler Blackcomb, and retain most of the staff. Brownlie will continue as the CEO, and will become a senior leadership team member for the Vail Resorts’ mountain division. Vail Resorts will continue ongoing negotiations that are being held with First Nations groups regarding master development plans. The Epic ski pass, which presently covers 11 ski areas worldwide, will be extended to Whistler Blackcomb. Genetically-modified crops (GMOs) were touted as being the deliverance for the food security of the world by being engineered to resist insects and herbicides, but new research from the National Academies of Science, Engineering and Medicine is showing the process is not measuring up, at least so far. The good news from the research is that the agency found no issues with the consumption of GMOs in human diets, and the engineered versions of the crops appear to be as safe as the conventionally bred crops. The report looked at the rates of various diseases before and after the introduction of GMOs in commercial farming in the 1990s. One of the primary uses for genetically engineered crops was to increase yield by making them resistant to insect damage and toxic weedkillers. For quite some time, scientists have hoped to develop these type crops to make food sources more plentiful and boost profits for farmers, with the goal to make the business more profitable and entice more to participate. 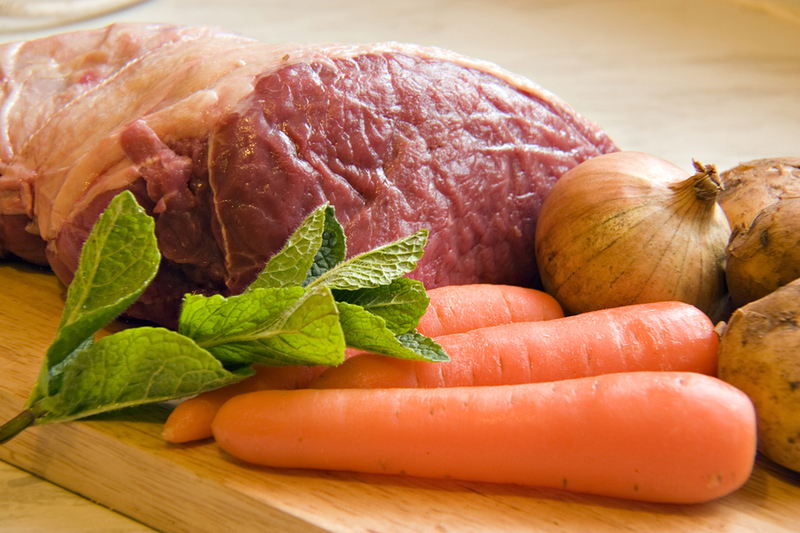 Also, it was planned to make the world’s food supply more secure by creating surplus. Some 12 percent of the world’s cropland is currently being used for growing genetically engineered crops, primarily soybean, cotton and corn. The study found, that while less insecticide is being used, there was little evidence that the GMO crops have increased yields in the United States any more the the conventional crops were improving already. 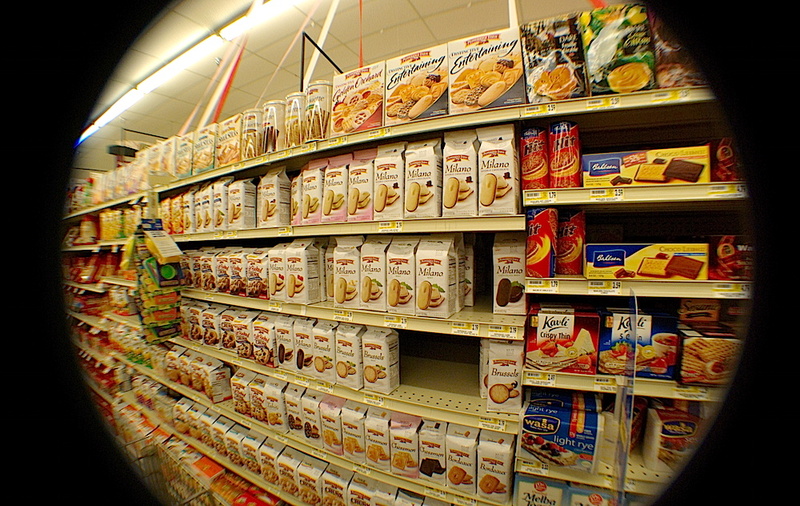 Some US states have already enacted legislation to force food suppliers to label their products with GMO labels, but with the new evidence, it is unclear if consumers will heed the labeling or even if it should. 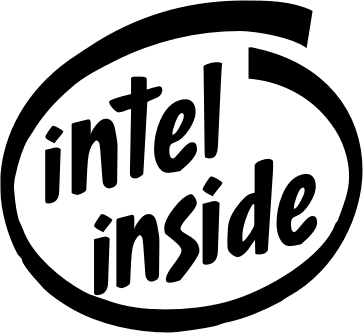 A giant in the PC era, making processors that powered both Windows-based personal computers and Macintosh machines, Intel made a serious strategic error – they turned down the opportunity to provide iPhone processors, believing it to be a flash-in-the-pan gadget. Now the PC era is ending, and as Intel struggles to adapt to the post-PC world the company has announced that by the middle of 2017 they will be laying off 12,000 employees, 11 percent of its workforce. Intel actually had two opportunities to become a major player in the mobile chip market. The first was the Apple iPhone business. The second was its ownership of a mobile chipmaker, XScale, which it sold for $600 million in 2006. The issue with chips for mobile devices is that they need to be less power hungry than the Intel chips used in desktop computers, which are plugged in. Mobile devices are all about battery life, and users are willing to compromise a bit on performance to increase life. Intel’s existing x86 chip standard that had been used since the IBM PC in 1981 was unsuited to this demand. Mobile device companies looked to a standard called ARM, which was designed for long-life, low-power mobile use. In addition to consuming less power, ARM is designed for customization, and licenses its design to companies such as Samsung, which makes the actual chips. This allows smartphone makers to combine many different functions on one chip, which helps keep power consumption down. These ARM chips dominate today’s mobile phone devices, and iPads and iPhones run on A9 chips that are based on the ARM platform. Android-based phones also run on ARM-based chips. When Intel sold XScale they believed that it would show commitment to their development of a lower-power version of the x86 chip called Atom. Although Intel has made progress improving the Atom chip, ARM chips have too big a share of the market for catch-up to be realistic. Intel will use a combination of “voluntary and involuntary departures” for its massive layoffs, and plans to consolidate its offices that are now worldwide, with facilities in California, Oregon and Arizona, and international facilities in Ireland, China, Israel and Mexico. They have not yet announced where most of the job cuts will take place. Even though Intel just announced a $2 billion profit for the first quarter of 2016, growth has stalled, leaving Wall Street worried about its future, as that figure fell short of Wall Street forecasts. In a statement, Intel CEO Brian Krzanich said, “We are evolving from a PC company to one that powers the cloud and billions of smart, connected computing devices.” However, Intel still relies on PC sales for about two-thirds of its revenue. 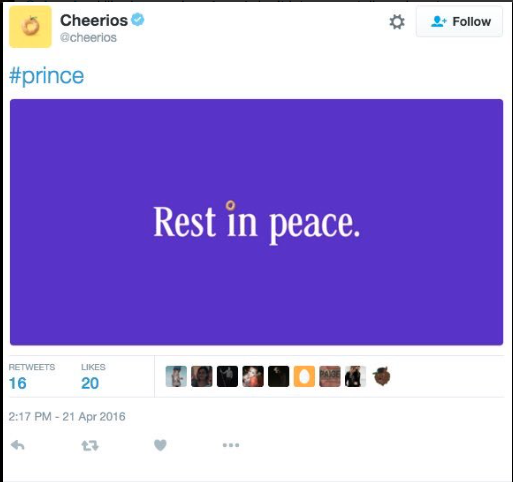 Cheerios has deleted a tweet that said #prince, “Rest in peace” after public backlash called it offensive and opportunistic. The problem? The dot above the “i” was a Cheerio. The General Mills-owned company released a statement after deleting the tweet, saying they were simply seeking to acknowledge the death of a legend who came from their own Minnesota hometown. “But we quickly decided that we didn’t want the tweet to be misinterpreted, and removed it out of respect for Prince and those mourning,” said Cheerios. Although other companies took to Twitter to post tributes to Prince, Cheerios received by far the most attention. For example Spotify tweeted “We join the world in mourning the loss of a genius, a legend, and an inspiration to generations of artists and fans.” NASA posted a picture of a purple nebula, tweeting, “A purple nebula, in honor of Prince, who passed away today.” Chevrolet’s tweet said, “Baby, that was much too fast. 1958-2016.” Apparently the problem with Cheerios’ tweet was, well, the Cheerio. The 57-year-old Prince died last Thursday at his Chanhassen, Minn. home. Internet TV: Can Netflix hold off the competition? Netflix is by far the biggest player in the internet streaming video game, but there are rumblings that serious challenges may be coming down the road for the company, and Amazon may have just fired the first shot. Amazon announced its Prime Video streaming service will become a standalone offering and will be in direct competition with Netflix, but there other companies with deep pockets that may be planning to jump on the train also. Companies like Apple, Google and Facebook are all looking at some form of internet video streaming and, while their business models may not be exactly like Netflix and Amazon, they certainly can take a share of the streaming pie away from one of the more established companies. But Netflix isn’t just resting on its laurels. The company announced it had expanded its services to over 130 countries and added 6.7 million new subscribers to its base in just the first quarter of this year. The company reported that 2.2 million of the new members were from the US as well. The recently announced price increase to its “grandfathered” subscribers, who had been paying a lower rate if they already had the service prior to the increases in 2014, is expected to slow growth for the second quarter, but the company is investing heavily in new and original programming, with intentions of remaining the top service. Competitors like Apple and Google may go the route of making a large acquisition instead of buying video content like the Netflix model, for instance, companies like Paramount studios, which reportedly is on the market, or a distribution business like Starz. At the end of the day, it remains to be seen which type of service will win out, but one thing is certain, the way we watch TV is changing, and the successful company will be the one that anticipates what the public wants to see, and how they want it delivered. A new report by IMS Health. a global information and technology services company, is saying that the amount of money spent on prescription drugs in the United States in 2015 rose 8.5%, with recent price hikes and the introduction of some very expensive new medicines as the leading causes, according to the LA Times. 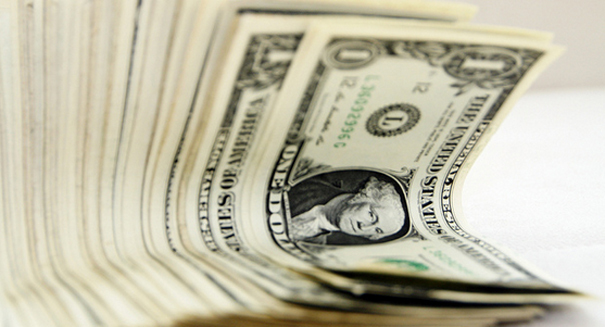 The report estimates that a combined $309.5 billion was spent by patients, insurers, government programs and other payers, and the IMS Institute for Healthcare Informatics predicts the number will rise to between $370 and $400 billion by the year 2020. Skyrocketing drug prices have been hitting the headlines in the past several months, and that has led to calls by elected officials and presidential candidates to slow down the escalating costs. Insurance companies are trying to pressure drug manufacturers to offer greater discounts and lower prices, but with little competition in the markets, not much relief has been noted. But rising drug prices is not the only factor in the increased amount of spending on medications in the US. Since the inception of the Affordable Care Act, an additional 20 million people now have health insurance, and many are being prescribed medications for conditions that had been undetected, since many of those people were not seeing a physician, because they could not afford it. Murray Aitken, the institute’s executive director, said the uptake in spending is probably partially attributed to more brand-name drugs being purchased by the newly insured as well, but added those new patients are mostly getting the lower-cost generic versions of their medications. Still, one of the major factors for the increase is the introduction of new medications for diseases like cancer and hepatitis C, among others, that often cost over $100,000 for a year’s worth of treatment. Coupled with drug companies raising the price of older drugs one or more times per year, the increased spending adds up rather quickly. Reports of companies buying the rights for older medications and quickly jacking the prices up several times over the previous cost are adding to the perception that “big pharma” is to blame for most of the cost. But, for the year 2015, 43 brand new drugs were introduced, along with an additional 30 that were re-formulated, and many of those come with hefty price tags due to companies trying to recoup their research and development costs. The good news is that the 8.5% increase in 2015 was smaller than the 10.5% rise in 2014, and the institute predicts the rate of increase to continue to slow, rising four to seven percent over the next few years. 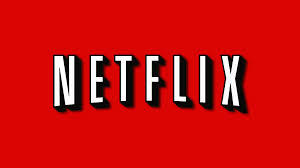 Last year when the streaming video giant NetFlix raised the cost of their subscription service to new subscribers, the company left the rates as they were for those already using a plan, adding they would eventually raise rates for those customers at some point in time. Well, according to decider.com, that time is now, at least, next month for all those who were “grandfathered” in with the old rates. NetFlix plans to raise the rates for its Standard option, which allows for two screens to be watched simultaneously, to $9.99 per month for all subscribers. That option is the most popular among subscribers. Some long time customers were paying either $7.99 or $8.99 per month for the Standard plan, meaning the service will cost you either $24 or $12 a month more, depending on which rate you had been paying. So, beginning in May, everyone will be paying at least $9.99 per month to binge watch your favorite old tv shows or the new season of House of Cards. The increase will affect about 37 percent of the companies customers, around 17 million subscribers, and will net the service about an extra $34 million each month, according to calculations done by UPROXX. The company has not announced their plans to raise the rates, and one survey found a large number of people are unaware their rates will rise on next month’s bill. The company did say when they said new members would be paying a higher rate than its older customers in 2014, that eventually all would be paying the same. Experts are predicting that some of the subscribers to the service, an estimated three to four percent, will decide to cancel the service after receiving news of the rate hikes, but it appears the vast majority of the company’s members will just complain about it and continue to enjoy the programming. And it may not be all bad news. One would imagine the bulk of the additional $34 million per month will be invested in more new and original programming, since the company has been moving in that direction already. Plus, they already have us hooked on some series we won’t be able to live without when the new seasons of our favorites are released. It’s not like the cost of anything else we pay for isn’t rising. The state of Wyoming is facing a real crisis economically, primarily because of the loss of coal mining jobs in the area, which make up about 15 percent of the total work force, according to the Casper Star-Tribune. And the announcement by Peabody Energy and Arch Coal on Thursday of cutting of 460 jobs at America’s two largest coal mines is just adding more misery. 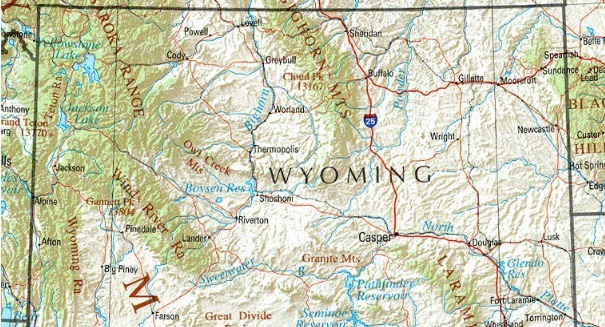 The Black Thunder coal mine near Wright, Wyoming, and the North Antelope Rochelle mine, south of Gillette, plan to reduce their work forces by 15 percent. It’s is a story that is all to familiar to the citizens of the state. But it isn’t just the coal mining jobs that will be impacted. All the support jobs from what are primarily mining towns will feed the cutbacks as well. Businesses in the affected areas will suffer, if not immediately, over the long run, as jobs at schools, hotels and small businesses in the area feel the loss of revenue and some may be forced to close as well. An industry once considered essential to American economy is reeling under increased regulatory restrictions, and pressure from environmental groups, and many of the residents blame Washington for the problems. The industry is also being squeezed by competition from inexpensive natural gas and a declining demand for coal in both the United States and China. Peabody Energy has appealed to its creditors for an extra 30 days to pay its debts, with concerns over huge liabilities from polluted mine sites, facing expensive clean ups, according to the Washington Post. Additionally, two of the four largest US coal companies have filed for bankruptcy in the past six months. Meanwhile, residents in Wyoming plan to take it all in stride, as many say they don’t necessarily blame the coal companies. One resident said you could read the writing on the wall, and in the end, he was just a number of many that lost their livelihoods. 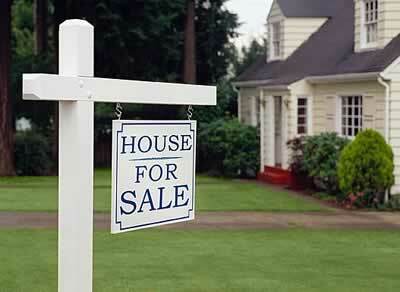 Most say they would prefer to stay in the area, but when it is all said and done, they have to make a living.